The Industrial & Management School is just two-minute walk (200m) from the main train station and near all bus and tramway services. 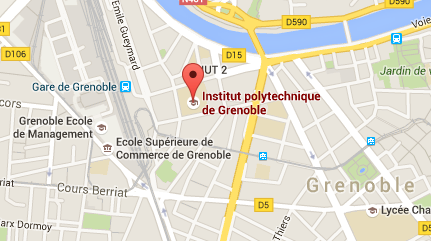 Some scientific sessions, common with the French National Conference INFORSID 2016, will take place in the IUT2 (Technology University) of University of Grenoble-Alpes. IUT2 is just one-minute walk from the Industrial & Management School (the street to cross). Situated near Lyon, France - approximately 95 km from Grenoble. Regular shuttle service available to the city of Grenoble. This is the main airport you should use if you want to travel in Grenoble by plane (very frequent flights, and regular shuttle to Grenoble (one per hour)). Situated near Geneva, Switzerland - approximately 150 km from Grenoble. Train and coach services available to the city of Grenoble. Situated in Saint-Etienne-de-Saint-Geoirs, France - approximately 45 km from Grenoble. Regular shuttle service available to the city of Grenoble. Grenoble is in southeastern France at the foot of the Alps and has excellent road and national rail links. Several parkings are available around the conference location, but they are rather expensive ! If you stay in an hotel with a parking, we advice you to let your car in the hotel and to come at the conference by walk or by tram. The Industrial & Management School is two-minute walk (200m) from the main train station and near all bus and tramway services. The website of the public transport company TAG (http://www.tag.fr) is available to help you to plan your trip. If your hotel is located in the city center, you can also come by foot: the Industrial & Management School is located ten-minutes walk from the city-center.